Sequel is the very highly sought after very desirable 3 cabin Owner's Version. She has never been chartered, always privately owned and enjoys many custom features including her factory fitted TekDek decks. Focused on blue water performance and comfortable living, the award winning Leopard 48 is a welcome addition to the Leopard line. From the design table and factory floor of Robertson&Caine, the catamaran industry’s leading manufacturer…………. Her modern lines, open floor plan and elegance set a new standard for the modern cruising catamaran……the Leopard 48 features a large forward cockpit with direct access from the saloon and foredeck. The raised helm station with easy access to the cockpit and side deck allows for shorthanded sailing while not separating helmsman from family and friends. The updated interior of the Leopard 48 provides both comfort and practicality. The galley is conveniently located between the outdoor and indoor living spaces with easy access to the helm, aft cockpit, saloon and forward cockpit. From the 360-degree visibility at the helm to the well protected fore and aft cockpits, the Leopard 48 is designed for a modern blue water lifestyle. Stepping on board the wide transoms, you are only 2 steps away from direct access to the cockpit and side decks. The raised helm station offers exceptional visibility and is easily accessed from the cockpit and side deck. The standard electric winch and all lines led aft make short- handed yacht control very manageable. From the helm seat, all sail handling and engine controls are within reach. The Leopard 48 also offers comfortable seating for up to 3 people at the helm. The clear and uncluttered deck layout of the Leopard 48 is emphasized by the recessed deck hatches. The sleek Leopard lines are easily recognized by the large teardrop shaped saloon and hull side windows, giving this yacht a very modern look and a source of organic light in the saloon and cabins. The large cabins in the Leopard 48 set a new standard for comfort. The yacht is available in a 3 or 4 cabin layout, with both designs offering comfort and practicality. The new and updated interior design provides a feeling of luxury inside the hulls. The starboard hull is entirely dedicated to the owner’s suite in the 3 cabin layout. The walk around center line queen sized bed allows for easy side access. With either a comfortable couch or optional storage unit, there is plenty of storage space in the passageway. The large master head features a stall shower with bench and a dedicated locker for a washer / dryer. The guest cabins are well ventilated and offer excellent lighting and storage space. All guest cabins feature ensuite heads with separate stall showers, toilet and wash basin. An abundance of natural light and ventilation defines the interior of the Leopard 48. The open saloon and galley layout allow for a modern indoor – outdoor lifestyle. The forward facing nav station can accommodate a full array of electronics and engine controls, while offering additional storage space under the seat. The spacious interior dining area can seat up to eight guests comfortably, and the dining table can be converted to an optional double berth. The open galley with corian countertops and standard stainless steel appliances blends effortlessly into the saloon, forward cockpit and aft-cockpit. The galley also has deep side-by- side sinks, a Vitrifrigo two drawer front-opening fridge and freezer and a Force 10 gas range with three burner stove top and oven / broiler. With many unique features, the Leopard 48 sets a new standard in the world of cruising catamarans. This catamaran holds nothing back in its pursuit to excel in all areas. Its sleek style, comfort, space, blue water sailing capabilities and unique innovative features combine to create a catamaran that fits right into the Leopard family. Spacious, bright and airy Saloon with double sliding doors aft to create an open connection to aft deck. Large generous seating area forward to starboard with dining table. Nav station port forward with watertight door to the forward cockpit just inboard. Generous galley layout in aft port corner and opposite to starboard is the 2 drawer refrigerator/freezer. 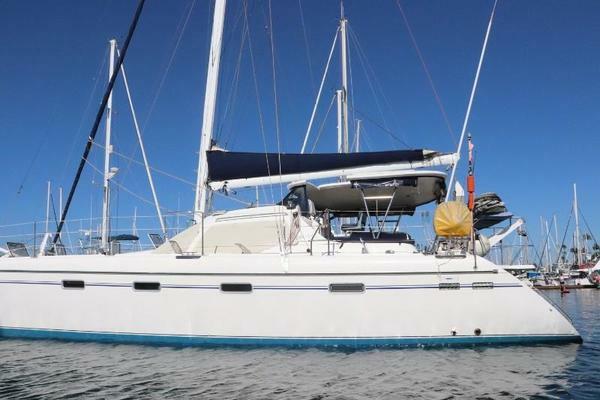 Owner’s accommodation uses the entire starboard hull with desk, sitting area, forward private ensuite head with separate shower and sleeping area aft. Port hull offers two identical Guest cabins each with their own dedicated head and shower. The forward cabin has an access door into a storage area, also accessible from on deck. All cabins have Queen berth. Cockpit has large seating area with table for dining or other outside activities. Forward cockpit provides another space to sit and enjoy the surroundings from. Hull – White Gelcoat composite Glass Reinforced Plastic (GRP), vacuum bonded E-glass and end grain balsa core. Isophthalic gelcoat and resin rich tissue to prevent osmosis. Structure - Composite fiberglass bulkheads and fiberglass modules bonded to the hull service with Crestomer structural adhesive. Transverse webs – molded fiberglass modules – bonded to lower hulls. A heavy transverse stainless girder chemically bonded and through bolted to main bulkhead. Girder also forms primary support for mast compression post. Deck & Superstructure – Composite GRP using balsa core with molded nonskid surface. Integrated hardtop supports mainsheet and small fiberglass hardtop over helm station. Access to Saloon via sliding doors and watertight door to forward cockpit. Cockpit, aft deck and transom steps fitted with TekDeck. Hull to Deck Joint – fiberglass laminated to hull. Full length white plastic rubrail with stainless cap along the joint. Bridge deck fiberglass laminated to hull.